LAST CHANCE OPEN HOUSE! Just Listed! Spacious 4 Bedroom 2.5 Bath Colonial with HardiePlank siding. Hardwood Floors throughout main level, except in kitchen which has Ceramic Tile AND MATCHING BACKSPLASH. Oversized Deck for entertaining or relaxing and easy stroll to historic downtown Herndon. Workshop and Exercise room in full-sized walkout basement . Lots of room for storage! Real estate is local. You’ve heard this time and time again and it has never been truer than it is today. While commentators and analysts spew out numbers left and right about the condition of today’s housing market, you should view their prognostications with caution. The national housing market is not like the Washington Metropolitan market. And the Washington Metropolitan housing market is not like the Northern Virginia market and the Northern Virginia housing market is not like Fairfax County’s market and Fairfax County is not like Herndon. And even in Herndon, individual neighborhoods are not the same. Like I said, real estate is local. 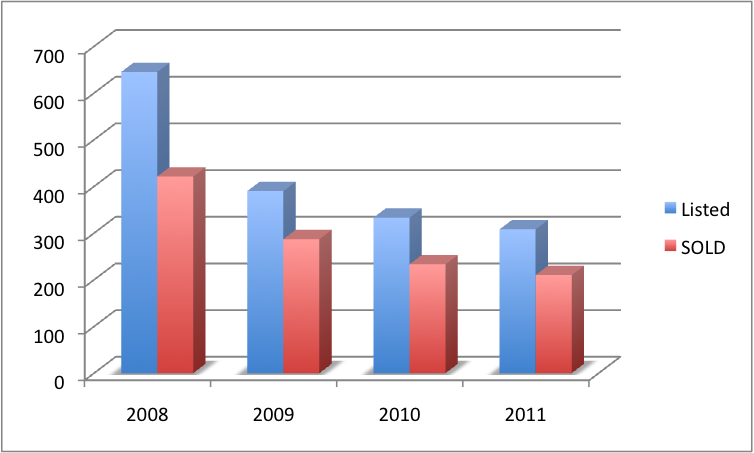 In Fairfax County, the number of SFD homes sold during the first three quarters of 2012 was 5,567. This represents a 9.5% increase over the SFD homes sold in the first three quarters of 2011. Herndon (20170) represented only a small fraction of those numbers, yet we outperformed the county in rate of price appreciation 2.76% vs. 9.2% and increase in the number of SFD homes sold 9.5% vs. 26%. Both numbers illustrate that the Herndon real estate market is not the same as the Fairfax County market. Rates began to climb slowly from their lows on Oct. 5th after the U.S. Department of Labor released its monthly jobs report, which showed the unemployment rate unexpectedly fell to 7.8 percent in September. Investors, who like to keep their fingers on the pulse of the economy, closely watch the report. When investors feel more confident about the economy, they seek riskier investments, and mortgage rates tend to rise. The Single Family Detached (SFD) market continues to improve in Herndon (20170). There were 291 SFD homes listed during the first 9 months of 2012 compared to 259 listed during the same period in 2011, a 13% increase in inventory. At the same time, the number of homes sold has increased from 158 in 2011 to 199 in 2012, a 26% increase. The Chart below illustrates month by month the increase in homes sold over the past two years. 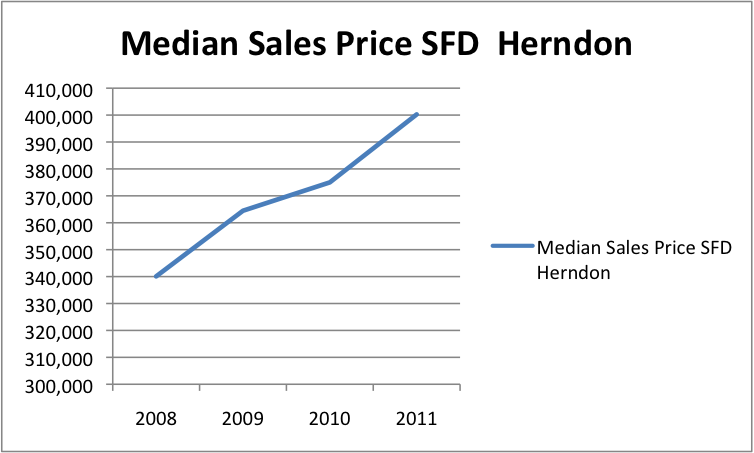 For sellers, the good news is not only are more homes selling, but that the median price of SFD homes sold In Herndon has risen from $405,000 in 2011 to $442,500 in 2012, a 9.2% increase. This restores overall SFD home prices to their 2004 levels with some variation by neighborhood. The Chart below compares the monthly median sold prices over the last two years. The number of unsold homes has also declined in both real numbers and relative percentage of listed homes. The number of unsold SFD homes decreased from 24% of listed properties in 2011 to only 11.3% in 2012, further evidence of a recovering housing market, albeit slowly. No one can predict the price of houses and the recent 9.2% increase in the median price should not be looked upon as an indicator of future appreciation. Rather, in my opinion, it a price correction after the horrific decline in prices from 2007-2010. Today, prices appear stable and interest rates remain low. But as owners/potential sellers become aware of the recent increase in their home’s value more of them can be expected to come down off the fence on the side of selling. The limited inventory that has helped boost sales prices could grow, and without a corresponding increase in the number of buyers the market playing field would tilt further to the buyer’s advantage. The demand for homes remains weak despite historically low mortgage rates. Even these rates have not been able to attract enough buyers to restore the housing market to its “normal” sales levels. As the perception that the economy is improving continues, the mortgage rates will begin to rise. There are many variables that affect the interest rates on mortgages. Even a small increase of ½-1 percent will squeeze out potential buyers from an already limited pool of purchasers. This drop in demand would further benefit remaining buyers. Today’s situation offers a homeowner the opportunity to take advantage of the low inventory and low interest rates to get the best price for their home. At the same time, they can benefit further and take advantage of these historically low interest rates if they decide to purchase when they relocate. Both conditions could change if the current balance of homes for sale and qualified buyers is disrupted. If you would like information on your home’s value or your neighborhood’s appreciation curve relative to competing Herndon neighborhoods call or email me. Herndon Home Prices Continue to Rise! PRICE OF DETACHED SINGLE FAMILY HOMES CONTINUE TO RISE!! In 2010, 233 detached single family (DSF) homes were sold in Herndon at a median sales price of $375,000. By 2011, the number of DSF homes sold had decreased by 10% to 210 (see chart below) but the median sales price increased to $400,250. Despite the continued drop in the number of homes sold from 421 to 210, over the past four years, the median sales price has increased over the same period from $340,083 to $400,250 (see chart below). The increase in price could indicate that price stability is finally returning to Herndon’s housing market. Nonetheless, it is and will remain a buyer’s market for the foreseeable future. Interest rates, while at historic lows, appear unable to attract additional buyers. The wild card in the housing market continues to be the foreclosures and short sales. In 2010, seventy-nine of the 333 listed properties were bank-mediated. This represented 24% of the market. Of the 233 DSF homes sold that year, 67 or 29% were bank mediated. By 2011 the number of bank-mediated properties on the market had declined to 56 or 27% of market. Of the 210 homes sold in 2011 43 or 20% were bank-mediated properties. While bank mediated homes declined, they still represent a significant share of the DSF homes market in Herndon. Another factor expected to influence the housing market this year is the pending expiration of The Mortgage Forgiveness Debt Relief Act of 2007. This law generally allows taxpayers to exclude income from the discharge of debt on their principal residence. Debt reduced through mortgage restructuring, as well as mortgage debt forgiven in connection with a foreclosure, qualify for this relief. This looming event could cause an increase in short sales as homeowners who are underwater with their lender reconsider their financial situation. If they expect to have to sell their home in the near future, should they do so before the end of 2012?